I'll obviously try and avoid story spoilers, but this much becomes apparent early on. Nier tells the story of 2B (at least first time around but we'll get to that later). She's a member of YoRHa, an organisation made-up of androids specifically designed to wage war. Their enemies are a gigantic horde of machines who were created and are controlled by an alien species. An alien species that invaded Earth, attacked Humanity and forced the survivors to flee to the moon. There they stay secluded, sending messages to guide the war effort from a hidden base, somewhere on the Lunar surface. Graphically the game looks good, environments are varied and well styled, we aren't talking photo-realism or anything here but they do look decent. You'll fight in a ruined city being reclaimed by nature, you'll explore wrecked and crumbling factories, walk through wild forests and (one of my highlights), visit an abandoned amusement park run by clown bots. All are well designed and have nooks and crannies everywhere, concealing treasures of all types. A minor gripe would be that fast travel isn't available till later in the story, this meant I spent a lot of time going back and forth between areas. Killing the same enemy types, in the same places while traveling past, gets frustrating quickly but it's a minor problem, one that's fixed about halfway into playthrough 1. Luckily, once the feature is allowed, it will be (mostly) available for the rest of the game. The main characters all have the fine, delicate features and large eyes familiar to anyone who's ever seen anime. Most YoRHa characters are clad in armour, black leather and lace, their weapons and flying mech suits have a very sleek, hi-tech look, one that'll remind you of a myriad of Japanese animations and comic books. Where the style really shines, to me anyway, was in the design of the enemies. They are varied, having different abilities, both melee and ranged, can be ground-based or flying, humanoid or animal. At times they will appear harmless and are almost cute in some forms. Much like the minions from "Despicable Me", they can be very charming and funny and sometimes come across almost like innocent children. This, of course, gives the moments where they show anger, fear or violence much more emotional weight. Anyone who doesn't get a little pang of guilt or a twinge of empathy at some point in the story, well they have a harder heart than I'll ever have! These little guys have some of the saddest side quests in the game, with a few ending very darkly indeed! Boss design and stories are also well done and have some very fine cutscenes, and satisfying battles, associated with many of them. The story of the Amusement park boss is a particular stand out. First time around, very little reason is given for why she is the way she is. Later playthroughs give details of her story and her reasoning, explaining the horrific acts she carries out and what motivated them. Most of the time, gameplay is from the "Devil May Cry" school of fast-paced, hack and slash combat, but you'll also get to experience both chunks of 2D platforming and whole SHMUP sections too. This could have resulted in a mishmash of clashing styles but it actually all comes together well. I found the shoot 'em-up sections, though rare-ish occurrences, to be an enjoyable change from the usual combat. Speaking of which, movement and fighting are tight, responsive and enjoyable. You have the usual lock-on, assigned to the left trigger, and a dodge on the right. You have two slots, each with a pair of weapons that can be equipped, one to X for Light attacks and one to Y for Heavy. Each has a different style, does varying damage and is capable of different length combos depending on where you assign it. Luckily every weapon has a stat page, so keeping track of all the strengths and buffs is an easy thing and you can quickly change between them with a button press. You also have a ranged weapon in the form of your POD, a little floating cuboid helper that peppers your targets with bullets, fries them with lasers, or blows them up with homing missiles, depending on the POD of course. You begin with one, the Gatling type, but exploration will reveal the other two. Oh, and you'll want to explore. 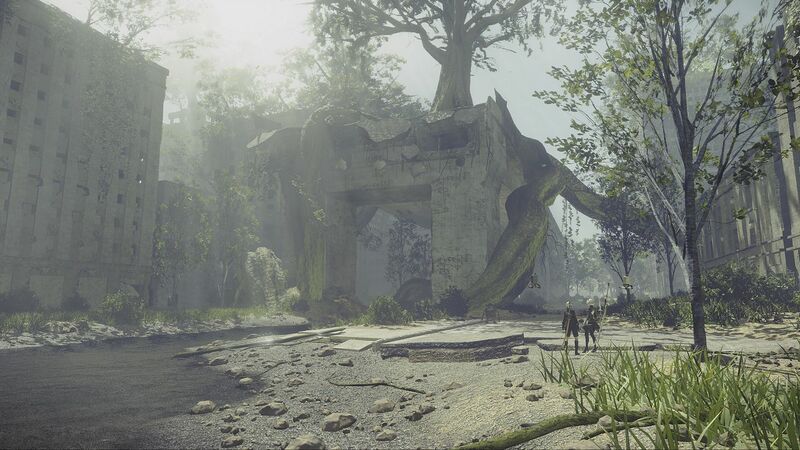 Seeing nature reclaim the ruins of once bustling cities is only one reason, the others are the huge amount of resources, weapons, side-missions and equipment there is to discover. Chip sets can be found regularly, dropping from enemies, being found in chests and on sale from vendors. They provide various buffs and effects, some increased damage or movement speed. Others reduce the melee or ranged damage you'll receive. Yet others provide more health, healing, automatic item collection or a myriad of other effects. These all plug into "slots", the more powerful the chip, the more "slots" it needs. Balancing these will be your only way of creating different builds and will be the main thing that keeps you from dying constantly. Death is handled a little differently in Neir, you'll regularly come across the bodies of dead players, you'll be able to harvest these for resources or you can resurrect them, bringing a computer-controlled NPC into your game temporarily, one who will fight on your side. When YOU die though, not only will your avatar appear in other people's games, it will result in a "Dark Souls" situation for you. Racing to the location of your death, you'll be able to reclaim any chips and items left on your body. You must get there quickly however, because taking too long, or dying again, will result in losing all the cracking gear you probably had equipped at the time. Another handy little feature is that your body is marked on the map after death too, so finding it again is relatively easy. The levels aren't open world but more like a series of interconnected areas, some will be locked off till the story progresses but, once open, you can return to and re-explore these areas at your leisure. A small quibble would be that it isn't always obvious how to get to certain areas, at least when studying the map, which, unfortunately isn't that accurate or detailed. You'll find it fills in as you explore and unlock the various save points but it will never be that great. Keep an eye on it though, side quests are easy to miss and it is possible to lock them out entirely by furthering the main story. Watching for little red circles (important events) and for little red squares (side quests) before heading to any of the primary quests will serve you well, especially if you don't want to miss anything. If you do however, you'll get another chance at them on subsequent playthroughs, or by using the chapter select you'll get when you ultimately complete all the main stories. I glossed over this before but to truly FINISH the whole tale of Nier, you'll need at least 3 playthroughs. Complete the 1st as 2B and you'll then be given a save file. Load this up and a new "route" will begin, this time as 9S, 2Bs partner. You'll play through the same events and time frame again but from his perspective. There are missions, weapons, story beats, character motivations, bosses and even whole game mechanics that you'll miss if you don't continue playing after the first set of credits. After 9S and his playthrough, you'll be given yet another save file. This will unlock a 3rd part of the story, a continuation of the 2 that came before. Even after completion there are LOADS of alternative and hidden endings to also get and hidden bosses to find. All in all, the 3 main "routes" took me around 90-100 hours and I completed almost every quest. You could probably do it quicker if you knew what you were doing and weren't spending time grinding resources and exp to level up, so it's well worth its price tag, lengthwise. Overall: My only criticisms are small, on top of the minor quibbles stated earlier, the only relatively major-ish complaint is with the pacing of certain quests. It isn't explained that you'll have multiple playthroughs and a chance to go back and do everything. This meant I found myself spending a lot of time grinding and farming, trying to become powerful enough to win fights that I now know are supposed to be completed much later. It also meant I was overpowered when it came to normal story missions and could fight through some with very little challenge. Despite this, I feel it's well worth the time and money. The story evolves as you go and has many twists and turns. The main quest will leave you thinking about questions fundamental to existence. What makes something human? Can a machine ever be considered alive? The side quests have some great stories too, many with dark and tragic twists, showing the horrors of war but also how goodness can flourish, even on a battlefield. Not many games have impressed me this much and I'm glad I played it. I'd recommend that every Xbox owner give it a try, especially those who like their fast-paced combat to be paired with a decent story and interesting characters. Pick it up, if you get a chance. I did and I wasn't disappointed. Click here for his Twitter. Had fun writing this, so thanks to Tony for allowing me the chance to do it. Not bad for a first ever review, am I right?